You guys!!! 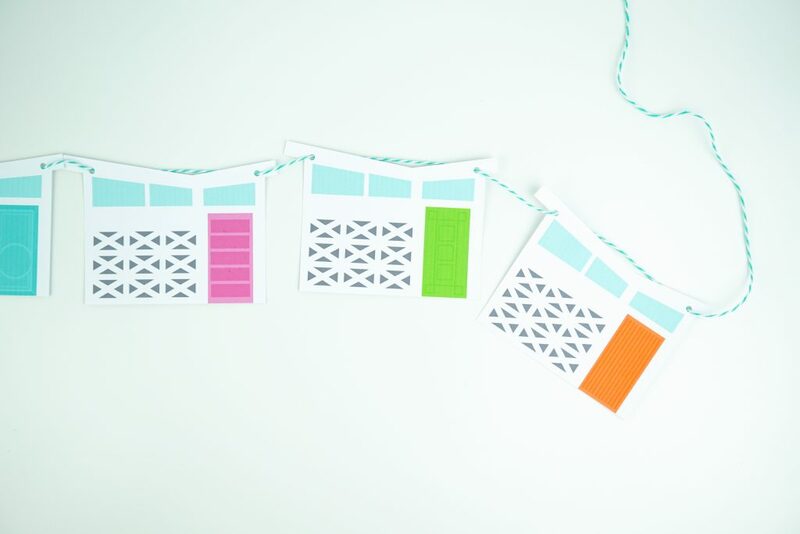 I have had so much fun creating with my NEW Wisteria Circuit Explore Air 2 and Cricut Easy Press. I am telling you both of these crafting machines are a game changer. I have had this idea in my head ever since I got back from Palm Springs in March. Have you ever been to Palm Springs?? It is so pretty, such a great place for a girls trip and I was so inspired the entire time I was there. I knew that the idea in my head would be a perfect PRINT & CUT project for my Cricut AND..to share with you! 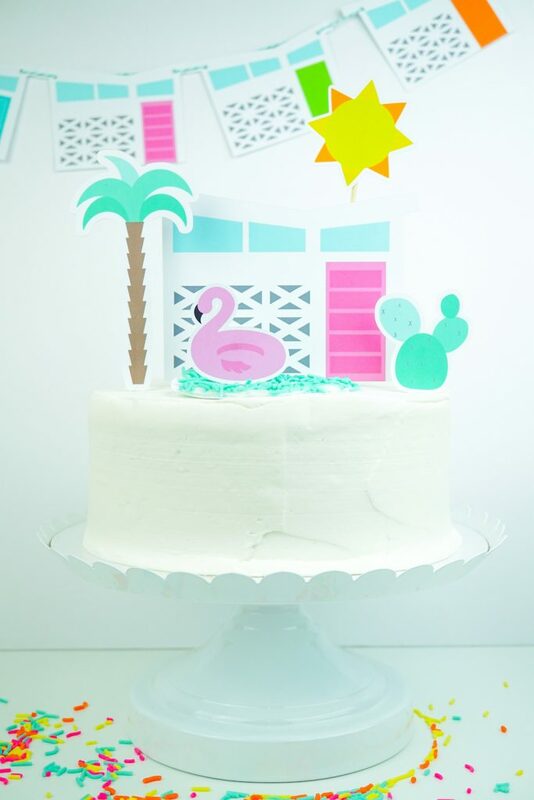 So, I decided to make a DIY Palm Springs Inspired Cake. 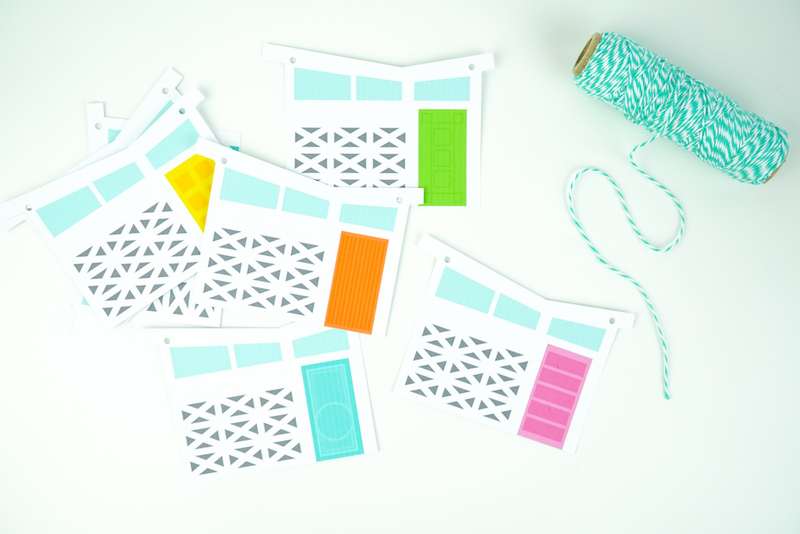 In case you missed the last two projects…you can see my vinyl decorated acrylic storage/snack bento boxes HERE or my DIY Rainbow Pom Pom Pillow with Cricut Iron on Vinyl using the Cricut Easy Press HERE. Either way…the on-trend lavender color is only available at JOANN stores for a limited time. 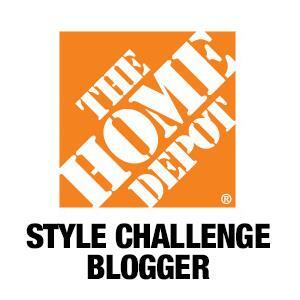 Ready to see my project? 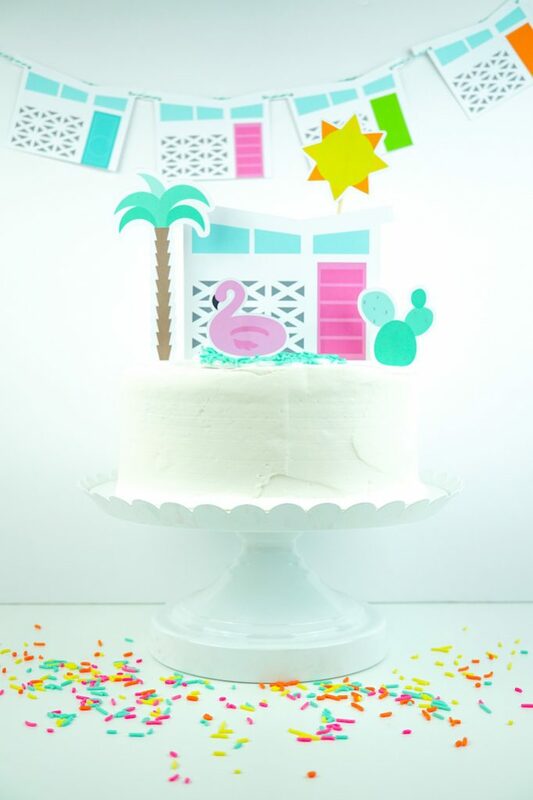 Well, if you’ve been following me for a while you know how much I love to DIY a cake and create party decor, right? 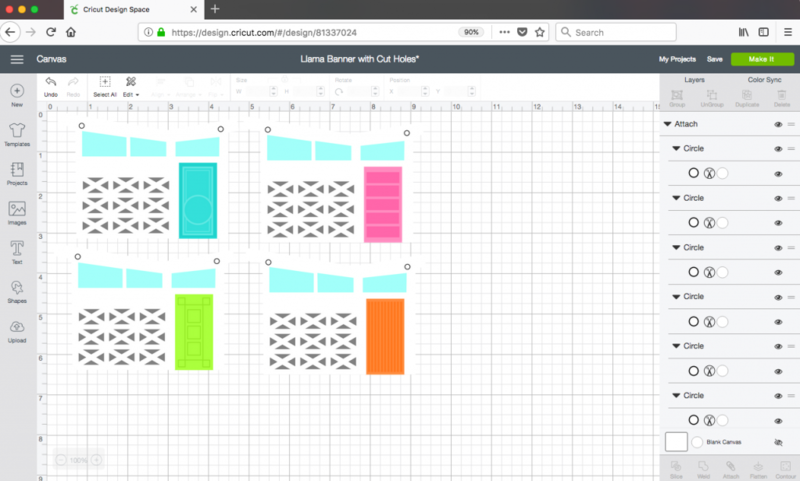 So that is exactly what I did…I design this mid-century house graphic with all different colored doors…just like the ones I saw in Palm Springs. I first drew it up in Photoshop, saved it as a PNG and then uploaded it to my Cricut Design Library. 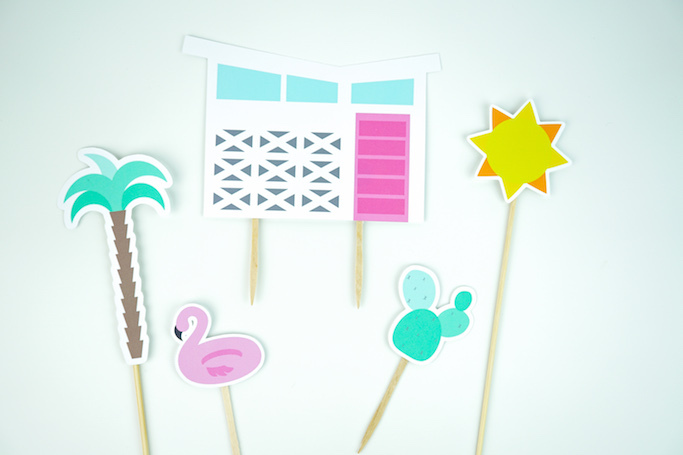 I used these colorful houses to make a party banner. Once I had the images scaled to the size I wanted, I used the PRINT & CUT feature on my Cricut machine. You first print the image on your printer, and the file is cut ready for your machine. There are registration marks that get print onto your file that tell your Cricut exactly where to cut. Pretty cool eh? Darling right? 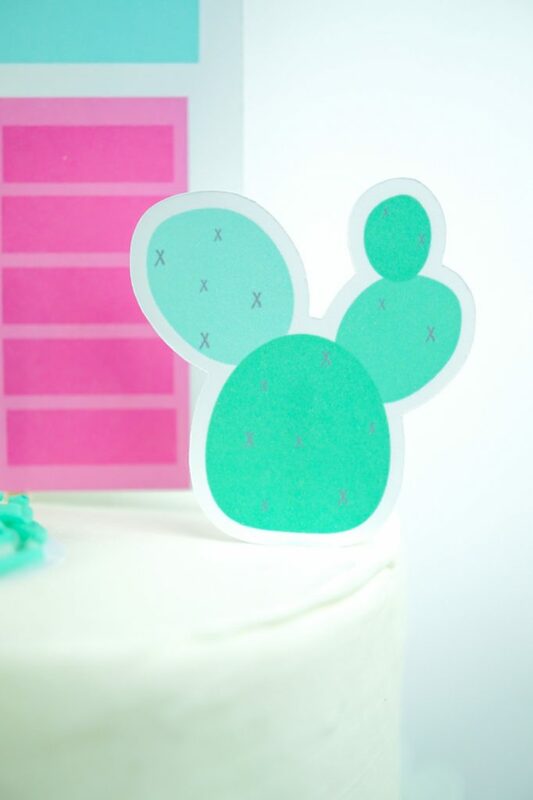 But the cake decor is even cuter! 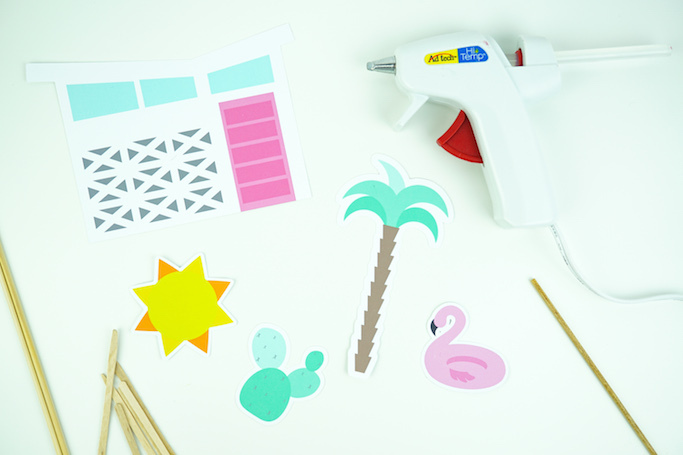 I designed some printables that are iconic images to Palm springs. 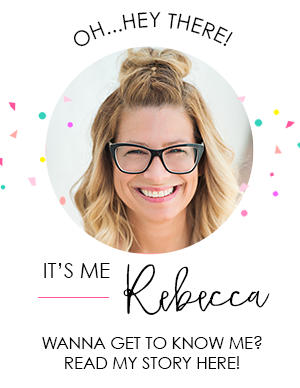 I them used the same Print & Cut feature on my Cricut like I did with the house banner. Once all of the shapes were cut out, I used hot glue to attach them to various length wooden picks. 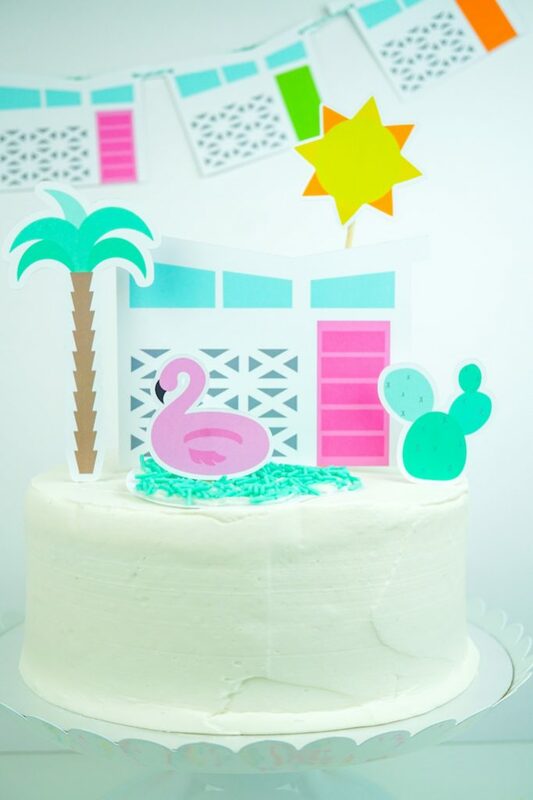 Now it’s time to create your own DIY Palm Springs Inspired Cake! 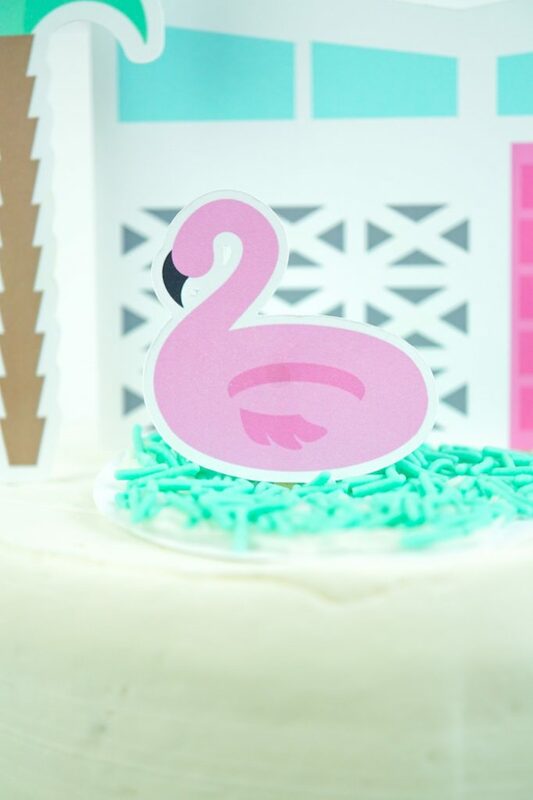 I love using make & take cakes with plain white icing from Target and then fancy them up with super cute printable! 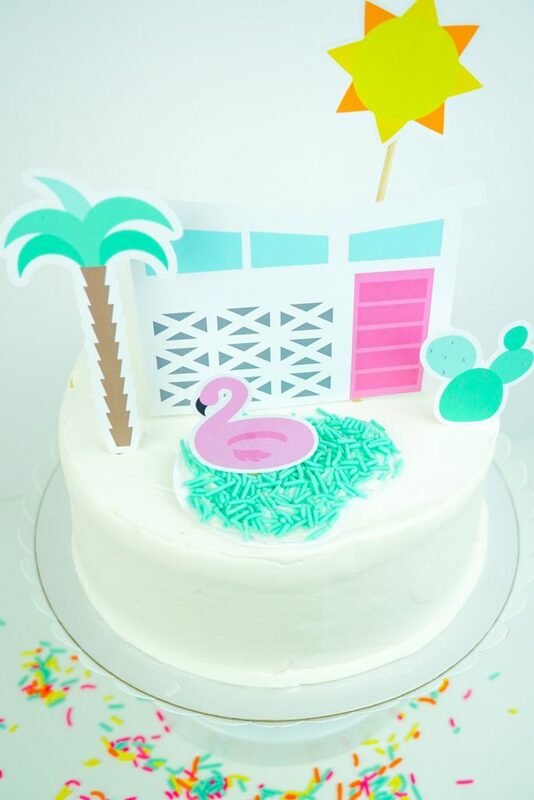 I placed all of my decorative picks into the cake and finished it up with a pool made from icing, sprinkles and of course a flamingo float! Who’s ready to party??!!! 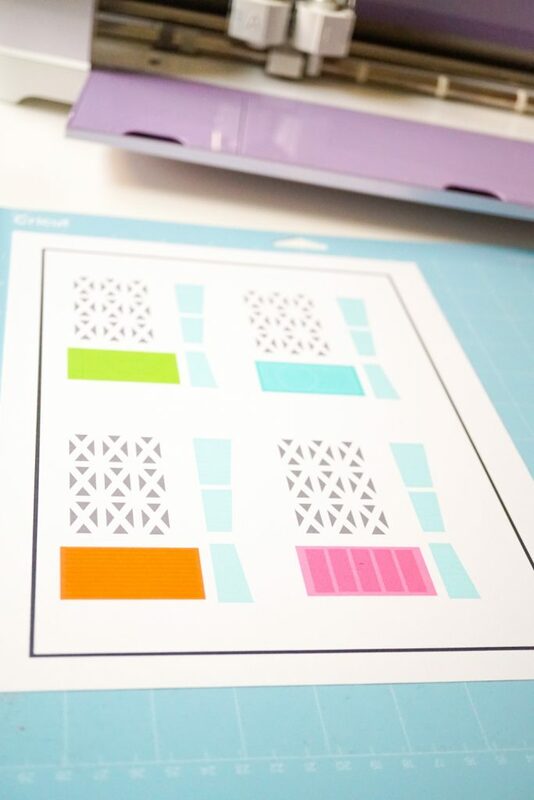 In a few easy steps using the print and cut feature on your Cricut Explore Air 2 from JOANN, you will be creating all sorts of amazing projects just like this. 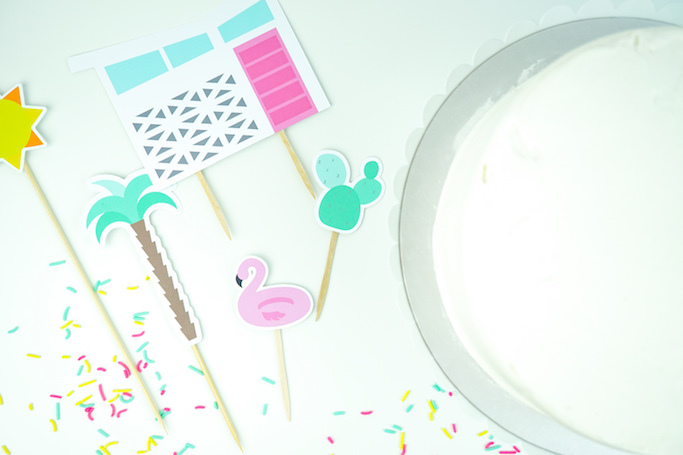 This would be such a fun theme to plan a party around, fun colors and trendy graphic? Count me in! Show me your print and cut project by tagging me in Instagram. Thanks for stopping by!